Professor of English James Longenbach encourages the appreciation of poetry, and National Poetry Month was established 20 years ago to do the same: “to highlight the extraordinary legacy and ongoing achievement of American poets, and encourage the reading of poems.” We invite you to revisit this page and discover some of the poetic richness that can be found at the University of Rochester. Members of the Rochester community read their favorite poems. More videos will be added throughout the month of April. “When Did It Happen?” by Regina A. Cerulli, read by Kate Cerulli, Associate Professor of Psychiatry and Director of the Susan B. Anthony Center for Women’s Leadership. “A Magic Moment I Remember” by Alexander Segeyevich Pushkin, read by Tatyana Bakhmetyeva, lecturer in the Susan B. Anthony Institute for Gender, Sexuality, and Women’s Studies. “First Fig”, by Edna St. Vincent Millay, read by Joan Saab, Associate Professor of Art History and Chair of the Department of Art and Art History. “An Elegy for My Daughter,” by Muhammad Ibn al-Khiyami, as translated and read by Emil Homerin, Professor of Religion and Chair of the Department of Religion and Classics. “Apricots,” by Professor of English Jennifer Grotz, as read by the author. “The Argument of His Book,” by Robert Herrick, as read by Honey Meconi, Professor of Musicology, Chair and Professor of Music, College Music Department. “You Who Never Arrived,” by Rainer Maria Rilke, as read by Nigel Maister, Russell and Ruth Peck Artistic Director of the International Theatre Program. “De Profundis”, by Georg Trakl, translated by James Wright and Robert Bly, read by Stephen Schottenfeld, associate professor of English. “Be Not Defeated by the Rain”, by Kenji Miyazawa, translated by David Sulz, read by Mari Tsuchiya, Senior Library Assistant, Outreach, Learning, and Research Services. Translation used with permission. “Idea 61: Since there’s no help, come let us kiss and part”, by Michael Drayton, read by Honey Meconi, Professor of Musicology, Chair and Professor of Music, College Music Department. 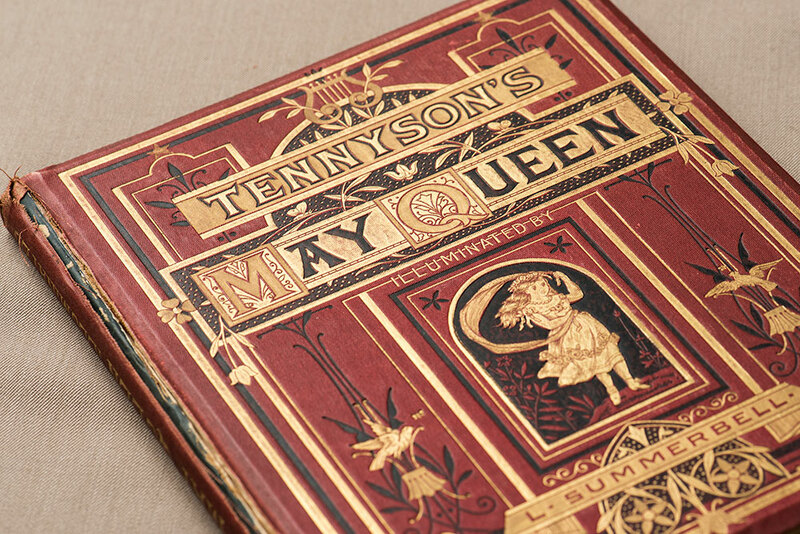 First published in 1832, Alfred Lord Tennyson’s poem “The May Queen” is brilliantly set off in this illuminated edition designed by L. Summerbell (London: Frederick Warne, 1870s). The enormously popular Victorian poet succeeded William Wordsworth as poet laureate of Great Britain and Ireland, and held the post for 42 years. 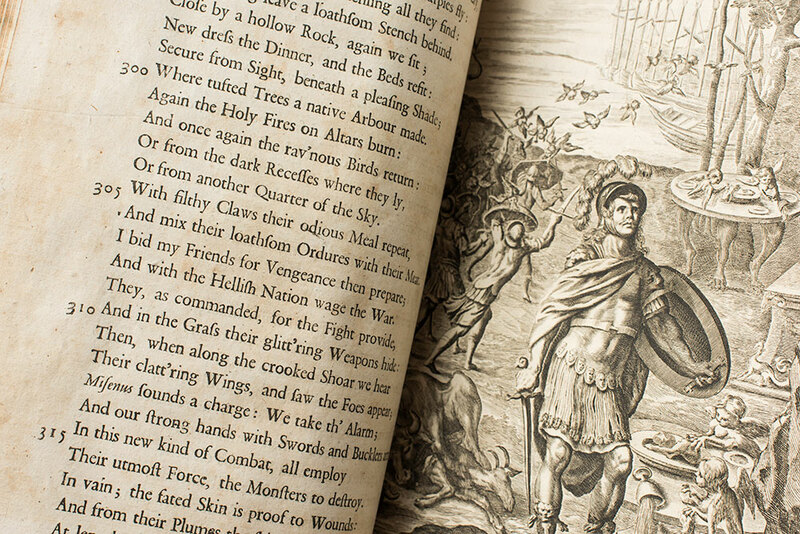 Dryden’s The Works of Virgil. The library holds about 200 first and early editions of works by 17th-century poet, playwright, critic, and translator John Dryden. 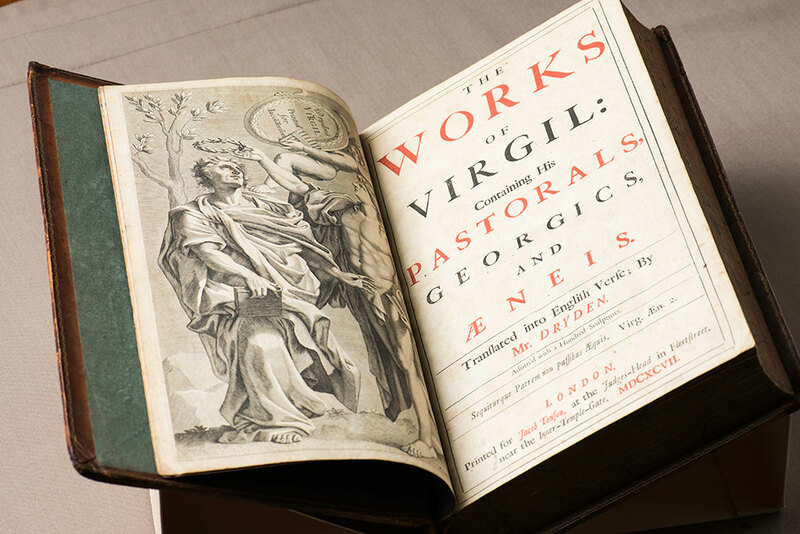 Also the first official English poet laureate, he was so influential that his era is sometimes referred to as the “Age of Dryden.” This is a first edition of The Works of Virgil: Containing His Pastorals, Georgics, and Æneis. Translated into English Verse by Mr. Dryden, Adorn’d with a Hundred Sculptures (London: Jacob Tonson, 1697). The Memorial Art Gallery’s collection contains this stunning 17th century Persian manuscript in watercolor, ink, and gold. 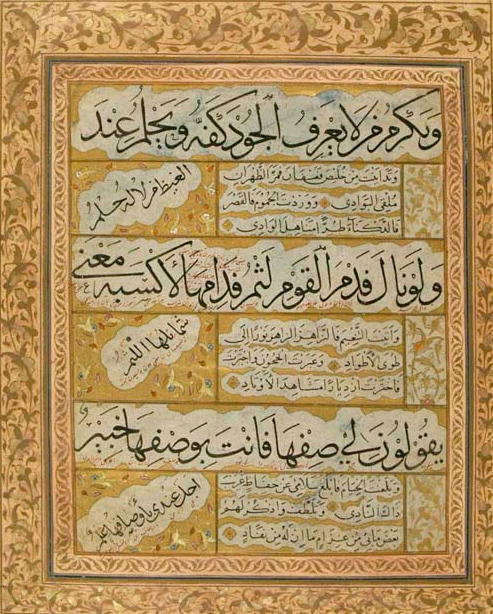 The large Arabic script and the Arabic in the “cloud” shapes are verses from the poet Umar Ibn al-Farid’s Wine Ode, the most famous mystical poem on wine in Arabic. Ibn al-Farid (1181-1235), who studied Islamic mysticism and Arabic literature in Cairo and Mecca, composed poems that generally embrace a view of existence in which creation is lovingly intimate with its divine creator. 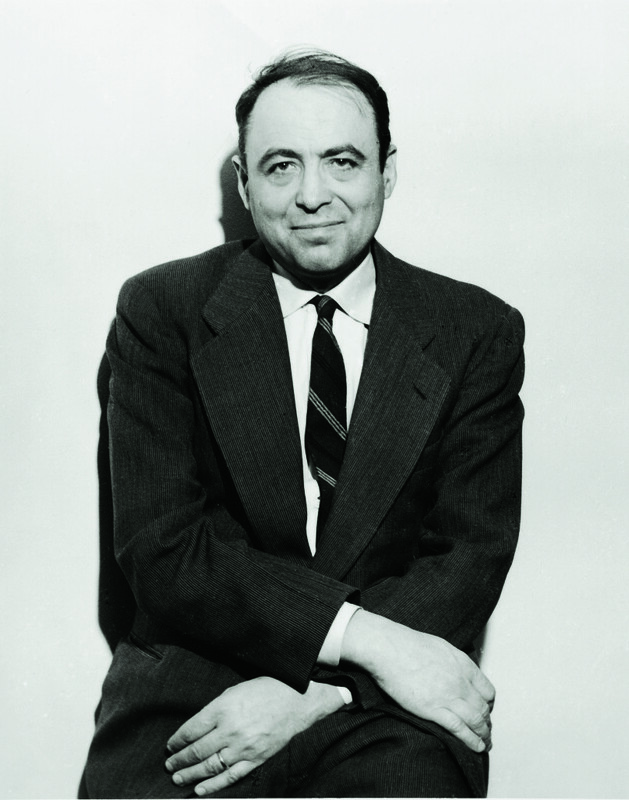 In a posthumously published memoir, University poet Hyam Plutzik, describes early aspects of his efforts to become a poet. Seventy-five years after it was written by a twenty-something college graduate—and long before that graduate became a Rochester professor—Hyam Plutzik’s eloquent Letter from a Young Poet still resonates with today’s millennials in their quest for life’s calling. 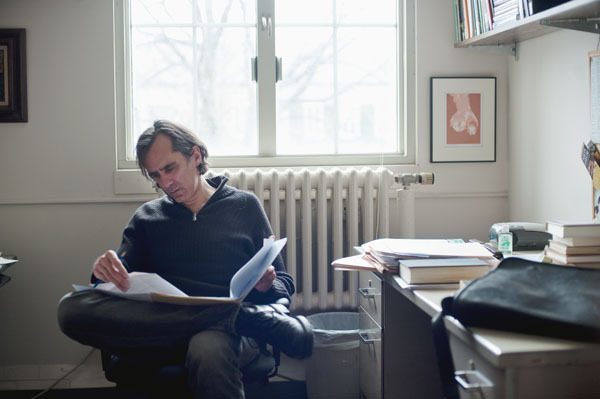 Addressed to Odell Shepard, Plutzik’s mentor at Trinity College, the 72-page letter is a “song of the self and the soul,” in the words of poet Daniel Halpern, who wrote the Foreword to the book, published in 2015 by Trinity’s Watkinson Library. 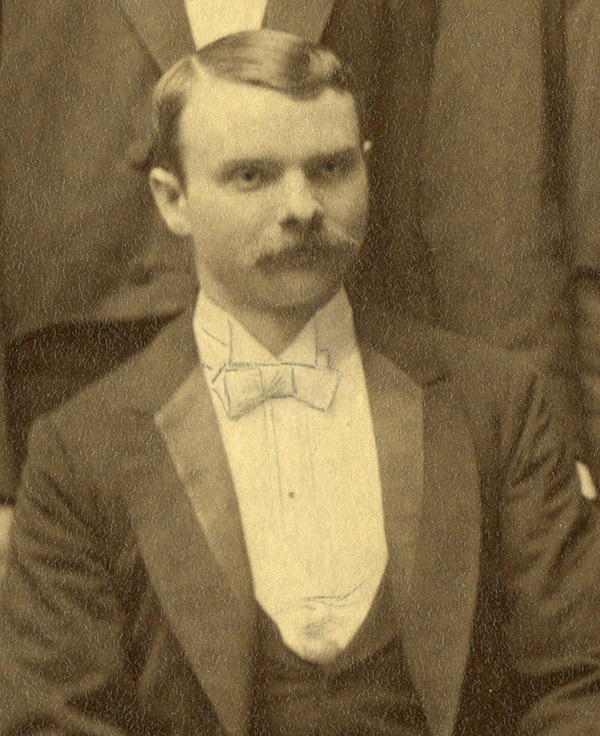 During the 1912 Rochester Centennial, Swinburne was named City Poet. As part of the celebratory proceedings he read a 30-stanza poem that includes a “conversation” between the river and the well-known Statue of Mercury, then atop the Kimball Building. 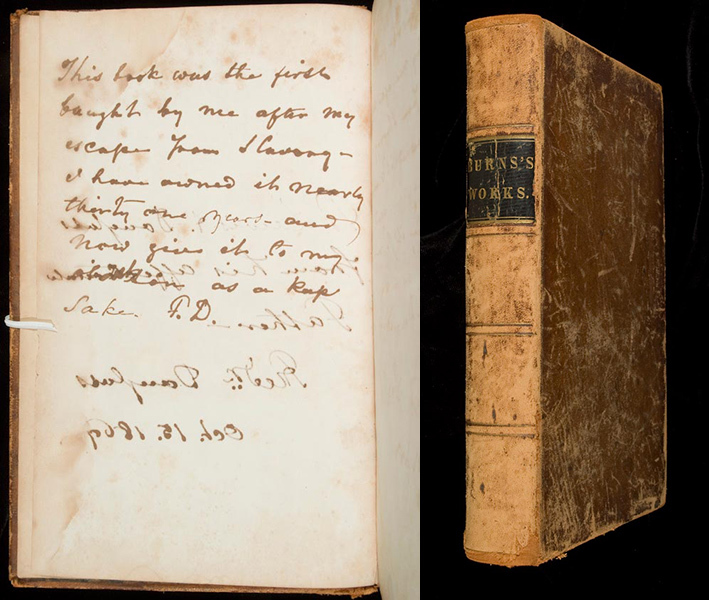 Swinburne published and printed books of his poems at his printing firm on Exchange Street. 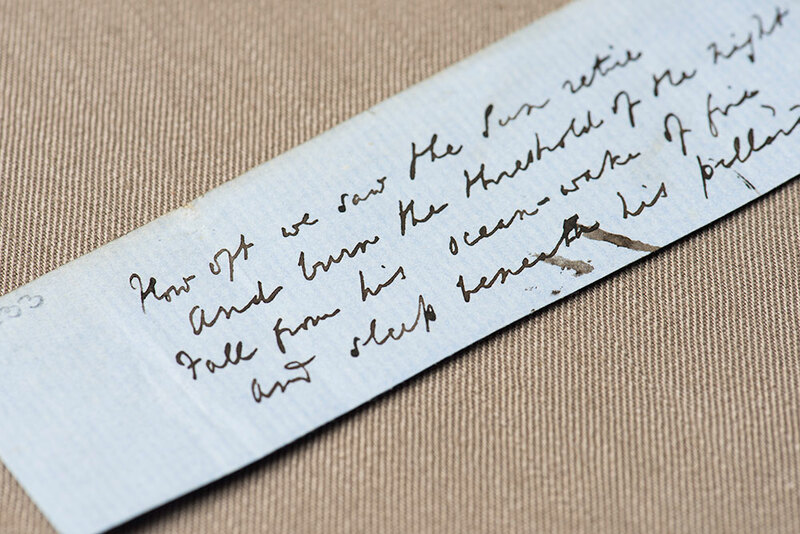 His 1907 Rochester Rhymes is dedicated to his sister Rose, whose death in 1926 would cause him to take his own life on December 17 of that year by jumping into the Genesee. It took another six months before his body was found and identified. 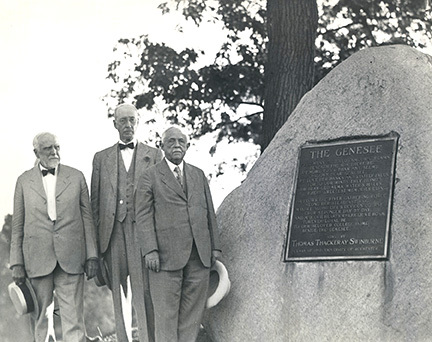 Herman LeRoy Fairchild, Edward Foreman, and Rush Rhees standing beside the Swinburne Rock. Swinburne’s will directed that his ashes be scattered in the Genesee, but as Professor of English John R. Slater wrote in the November 1951 issues of Rochester Review, “those who knew and loved him best did not obey him…they kept his ashes until the time was right…” Purportedly, a box with the ashes was buried four feet beneath the memorial boulder which stands near the Interfaith Chapel. But when the boulder was moved in 1968 and the area beneath it was searched, no box was found. “The best poems ever written constitute our future,” writes James Longenbach, the Joseph Henry Gilmore Professor of English, in opening his book, The Virtues of Poetry (Graywolf Press, 2013). “They refine our notions of excellence by continuing to elude them.” In interlaced chapters, Longenbach considers the almost magical powers, or virtues, that poems can enact through the most ordinary means: among them, compression, dilation, intimacy, and otherness. He leads readers, with attention to the smallest inflections of language, through works by such poets as Shakespeare, Yeats, Dickinson, Marvell, Whitman, Blake, and Ashbery, and finds within them examples of the endlessly diverse powers of language. Read more in Rochester Review. 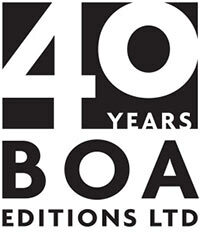 BOA Editions, a not-for-profit publisher of poetry and other literary works, marks 40 years of cultivating and publishing new and established poets. 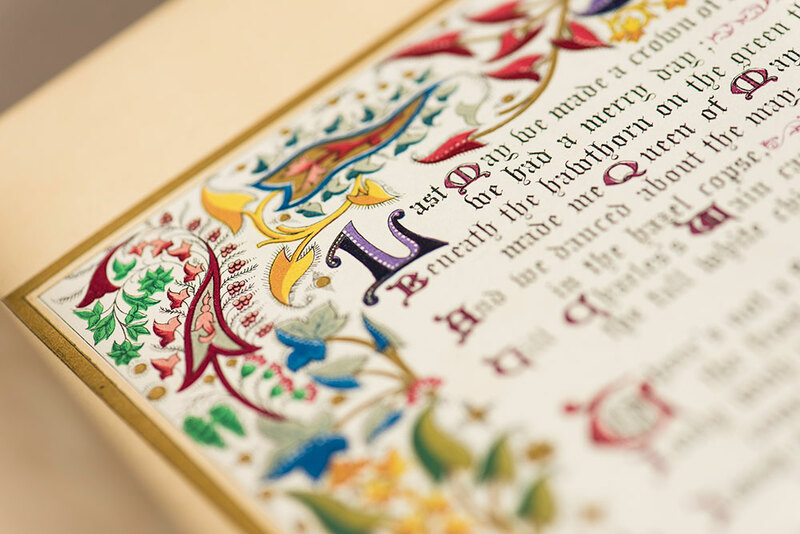 River Campus Libraries recently acquired the press’ last decade of publishing archives. This retrospective will explore BOA’s evolution over the years through an extensive display of BOA volumes published between 1977 and 2015. Selected typescripts, book and cover designs, correspondence between authors and editors, and BOA publicity samples—all drawn from the archives of BOA Editions acquired by the River Campus Libraries beginning in 2005–will reveal the lifecycle through which poetry and literature move from submission to published work.